Kitty Bingo Review | Get £30 Bonus + 100 Slot Spins! 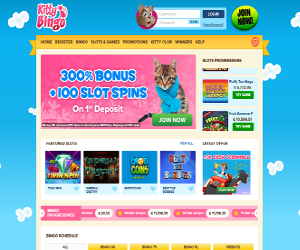 Kitty Bingo has been one of the most popular online bingo sites since its launch in 2012. The Dragonfish brand has designed by the same creators behind Wink Bingo, Posh Bingo and Tasty Bingo. However the site operates on unique and exciting bingo software. Kitty promises a top-notch gaming experience, offering premium games and a variety of promotions and bonuses that are bound to keep you reeling for more! New players to Kitty Bingo receive a fabulous welcome bonus of 300%! That means you get £30 Bonus on your first deposit of just £10. Additionally, new players also receive the lovely gift of 100 Slot spins! The good news doesn't end there for new players, though. Once you register, you can play in the Free Bingo room every day every 30 minutes. Once you're a registered player at Kitty Bingo, you will get an additional bonus on your 2nd and 3rd deposit. Kitty Bingo has 100+ games including slots, roulette, scratch cards and progressive jackpots. These games include top selections like Sugar Train, Shaman's Dream and Fluffy Favourites, just to name a few. This is in addition to a massive variety of unique 75 and 90 ball bingo games. There is truly something for everyone, providing an excellent online gaming experience. 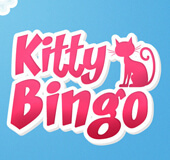 Kitty Bingo Mobile lets you bring your favourite bingo site with you wherever you go. Whether you enjoy hanging out with the roomies using you iPhone, Android, Tablet or iPad, Kitty can accommodate you. To add the mobile app, all you have to do is go to the Kitty Bingo login, follow the prompts and bookmark Kitty to your device’s home screen. It’s that simple! When you make your first deposit at Kitty Bingo you’ll receive a lovely 300% welcome bonus and 100 FREE Spins! In addition to being able to access a full selection of top 75 ball and 90 ball bingo games, players can also play over 100 different games on Kitty Bingo Mobile. Some of the top games available include Fluffy Favourites, Bubble Time, Sugar Train, Shaman’s Dream, Irish Luck and Lady Robin Hood. Kitty Bingo accepts Visa, MasterCard, Neteller, Pay Safe Card and debit card payments. You can also register a FREE PayPal account where you can deposit and withdraw cash. It promises a fast, simple and safe way to pay online. All transactions on Kitty are strictly monitored by one of the best security systems, guaranteeing all information remains secure and private. Player information is never shared with a third party. Kitty is dedicated to providing the most responsible gaming experience for all of their players and work closely with Gamecare, which is the national resource for gambling related problems. They also provide educational information and training so that online gaming continues to be a positive experience for all.